PUTIN'S WITNESSES is a fascinating documentary that gives genuine insight into one of the most powerful men in the world today - Vladimir Putin. It's based on footage taken by Ukrainian journalist Vitaly Manskiy when he was the head of docs for Russian state TV in 1999 and 2000. This was the crucial period in which the first President of the new post Soviet Russia - Boris Yeltsin - stage managed the rise to power of his anointed successor - a then unknown ex KGB agent. 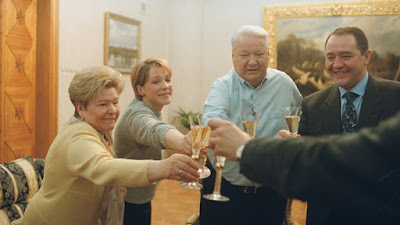 Yeltsin carefully crafted a shock resignation on New Year's Eve 1999 and handed power to Acting President Putin - giving the latter a clear 6 months to campaign before the next presidential election - gaining credibility by being seen with world leaders such as Tony Blair - and the full power of the state media. What's amazing is just how much access Manskiy had by virtue of being a trusted journalist. Often-times we see Putin address Manskiy informally but via the camera, and it's as if he's directly addressing us and explaining his view of politics and his aims for Russia. This young, already slick politician comes across as scarily charming, persuasive but also highly explicit about his aims for Russia. This is shocking because at the time pretty much everyone in the West saw Putin as "our man" - a continuation of Yeltsin - pro democracy, pro capitalism, pro trade - a person we could do business with. I can''t tell you how many investment bank research reports I read to this effect. And yet here we have Putin very clearly stating that his goal is to make Russia a strong power once again - a feared power - and that the national interest - the state's interest will always trump individualism. And this is exactly what he has proceeded to do - erode individual freedoms and pursue a policy of restoring the sphere of influence over the old USSR. What's even more shocking is that this result was clearly visible to many people inside Russia -but not to the one's who should've known best. Manskiy intercuts footage of his Putin with that of his home life. As soon as Yeltsin announces his resignation in favour of Putin, Vitaly's wife expresses fear and apprehension, convinced that he will be a populist strongman leader. By contrast, Yeltsin himself seems utterly wrong-footed. He may well have chosen Putin because he believed that Putin would guarantee his status once he retired. But in a chilling piece of footage we see an ebullient Yeltsin attempt to phone Putin to congratulate him on his election victory. Putin does not return his call. This is politics at its most brutal. The conclusion that we are led to draw from this documentary is that we have all been manipulated by Putin - Yeltsin certainly was, Vitaly Manskiy was in his creation of pro-Putin propaganda - the Western leaders who supported him and lent him credibility - and so was The City. And now, eighteen years later, that manipulation is drawing closer to home. The modus operandi of political assassination was also there from the start. In another chilling moment Manskiy explains who the personnel are in Putin's victorious campaign room and tells us how many have since been bumped off. The result is a film that is incredibly insightful, deeply frightening, humbling, and urgent. It's compulsory viewing for any engaged citizen. PUTIN'S WITNESSES has a running time of 102 minutes. It played Karlovy Vary 2018 where it won the Best Documentary over 60 minutes prize. The film is playing as part of the documentary competition at this year's BFI London Film Festival. There are still tickets available for two of the three screenings.